Steeping Tip: It is not unusual to be able to steep this leaf up to 4 times, depending on the amount of time ‘in the water’ each steeping. We have enjoyed Du Yun green tea steeped 2-3 minutes, then re-steeped short several times for closer to 2 minutes each. However it is also delicious steeped for as long as 4 minutes at first and then only re-steeped once for 2-3 minutes. Experiment to determine how you like it best! 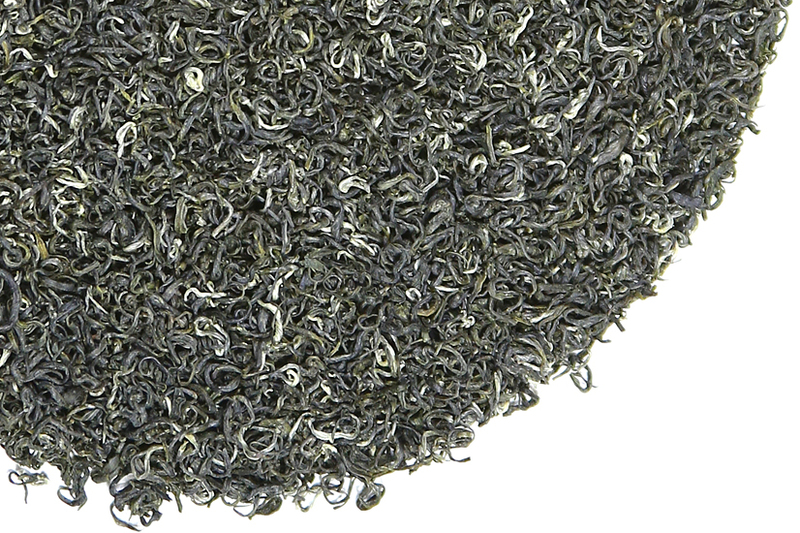 We are pleased to offer this delicious green tea again this year to our Tea Trekker taste enthusiasts. We feel that this green tea, produced a bit later in the season than our delightfully bright Spring Green teas, is a knock-out. Not well-known other than by tea lovers within China, this tea has been selected by Chinese green tea drinkers several times in the last decade as one of the top 10 contemporary green teas in China. When drinking this tea we tend to agree! Du Yun green tea is so full of deeply satisying flavor that it will appeal to everyone who enjoys green tea (and also those who are still trying to decide whether or not they like green tea!). It is smooth, smooth, smooth! 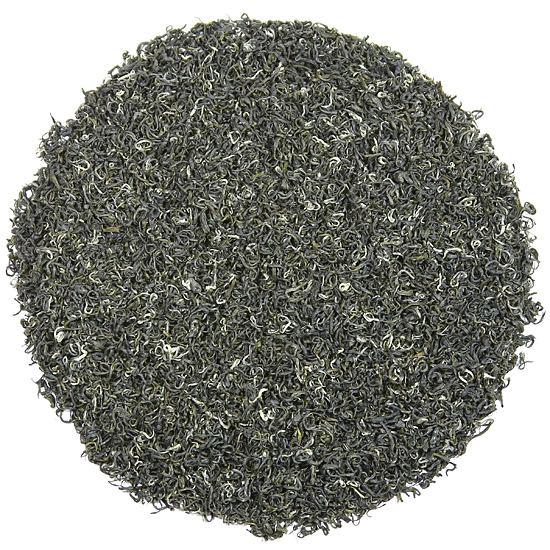 From the ruggedly beautiful mountainous region of southern Guizhou Province, the leaf for this tea grows in particularly lush and fertile soil that is perfect for tea plants. The history of tea in this region is long, but most of the tea produced there has traditionally been consumed either within the province or by knowledgeable tea drinkers in northeastern China. There are many wonderful and colorful stories regarding the contemporary history and naming of this tea, including reference to its having been enjoyed by Mao himself during the 1950’s; however these stories may be just that. There also seems to be confusion as to the ‘normal’ pluck of this tea – should it be the bud with one or two leaves? What we know for certain is that Tea Trekker Du Yun green tea is a mao feng pluck (two leaves and one bud) and that its flavor is fantastic. The shape of the dry leaf is that of a fairly large bi lo chun – that is, a classic ‘fish-hook’ shape. 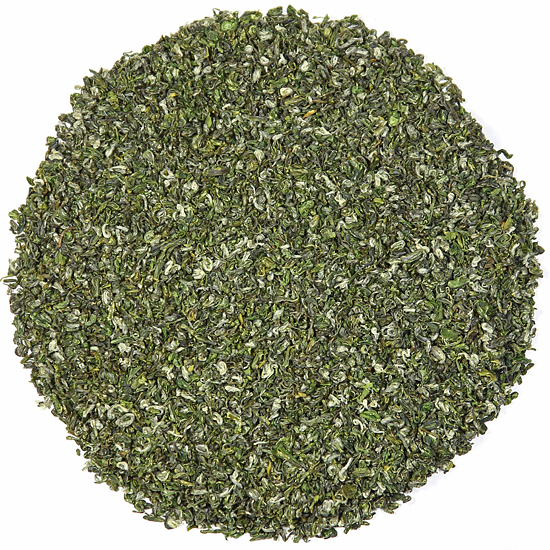 The dry leaf is a rich medium green, with many silver tips evenly distributed throughout the leaf. The aroma is fairly sweet and stimulates the urge to drink the tea. An experienced tea enthusiast can see the workmanship involved in the manufacture of this tea – the rolling and firing are expertly done. Completely hand-plucked and rolled carefully by hand in small batches, as the leaf unfurls in the cup or teapot, the evenness of the hand-rolling becomes even more obvious – this is an expertly-crafted manufacture. The flavor reflects some of the sweetness of the aroma, but with a deep, rich satisfying flavor that belies its gentle look and soft aroma. The tea yields a solid medium body, just the correct balance to complement the amount of flavor that is packed into the leaves. There is a slight lingering flavor that stays on the palate, but just enough to satisfy and not cloy. The liquor varies from pale amber to pale straw, depending on the proportion of tip in the particular scoop used, but the color does not affect the flavor, which is consistent from scoop to scoop.